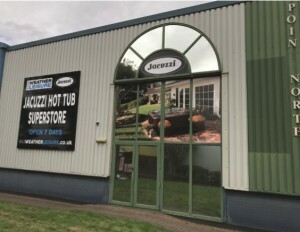 The new All Weather Leisure indoor showroom in Cannock, Staffordshire, enables customers to view a wide range of hot tub, swim spa and garden buildings on offer whatever the weather. The show centre is also larger than their previous premises, measuring 4000sq. ft. allowing an even greater selection of items on display. The company supplies and installs a wide range of quality hot tubs from well-known brands Jacuzzi and Viking Spas, together with swim spas, wooden garden buildings and thatched gazebos. Their services also include hot tub relocation, servicing and repairs.